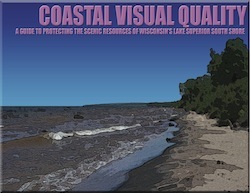 The Lake Superior Coastal Visual Quality Guide seeks to promote a general understanding of the visual resources of the south shore coastal landscape and to provide an overview of tools and techniques for the preservation of natural scenic beauty. It is also meant to serve as a companion document to Wisconsin’s growing library of community planning assistance guides. While this guide focuses on the south shore of Lake Superior, its recommendations, tools and methods for visual resource protection could be applied in virtually any community, regardless of geographic context. This project was funded by the Wisconsin Coastal Management Program and the National Oceanic and Atmospheric Administration, Office of Ocean and Coastal Resource Management.